Qualitative, community engaged, participatory research. Interdisciplinary partnering to advance social transformation. I received my PhD in Community Psychology from the Ontario Institute for Studies in Education, University of Toronto in 1993. I was an assistant professor in the Department of Community Health and Epidemiology, Dalhousie University (1998-2001) and a social scientist working with a community engaged cancer research group affiliated with Sunnybrook and Women’s College Hospital (2001-2003). I joined Laurier in 2003. I served as the coordinator of Laurier’s Community Psychology Program from 2007-2010 and the executive director of the Laurier Centre for Community Research Learning and Action from 2008-2012. 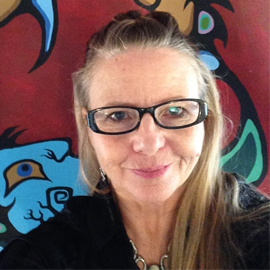 I am currently the director of the Laurier Indigenous Rights and Social Justice Research Group. I am also a faculty member at the Balsillie School of International Affairs. I have a long commitment to working with Indigenous peoples and Settler populations on Indigenous rights. My doctoral dissertation "Old Wounds: New Beginnings: Challenging the Missionary Paradigm in Native-White Relations” was based on my work with First Nations in the Yukon in 1991. With First Nations in Prince Edward Island, I developed Aboriginal Survivors for Healing, a center for survivors of residential schools funded by the Aboriginal Healing Foundation (1998). I have also worked as a visiting scholar at the Institute of Indigenous Studies at the Universidad de La Frontera, in Chile (2009). I am currently leading a collaborative research project on the internationalization of Indigenous rights; the Pan-American Indigenous Rights and Governance Network (PAIR-GN). My research focuses on the impacts of colonial trauma and the internationalization of Indigenous rights. Current work with the Centre for International Governance Innovation is focused on policy transformation to advance the implementation of the United Nations Declaration on the Rights of Indigenous Peoples (UNDRIP). I am conducting regional and global comparisons of the uptake and implementation of UNDRIP. Grace Anderson Fellowship, Internal Research Award, Laurier. Social Sciences and Humanities Research Council, Doctoral Fellowship. Opportunities exist for undergraduate, masters, doctoral students and post docs. Students generally enter the lab as volunteers working with other students on specific research projects on literature reviews, data collection and transcription as well as film and media projects all within a community engaged research group that works with local and international Indigenous partners. Mitchell, T. ed. (2014). The Internationalization of Indigenous Rights: UNDRIP in the Canadian Context. CIGI Special Report. Waterloo: CIGI. Fry, B. & Mitchell, T. “Towards Coexistence: Exploring the Differences between Indigenous and Non-Indigenous Perspectives on Land”, Native Studies Review. (in press). Mitchell, T. & McLeod, T. “Aboriginal Social Policy: A critical community mental health issue” . Canadian Journal of Community Mental Health. 33(1),1-14. (2014). Mitchell, T. & Enns, C. “The UN Declaration on the rights of Indigenous peoples: Monitoring and realizing Indigenous rights in Canada. CIGI Policy Brief, 39.” April 2014. Available at: http://www.cigionline.org/sites/default/files/cigi_pb_39.pdf (2014). Mitchell, T., & Maracle, D. “Healing the generations: Post-traumatic stress and the health status of the Canadian Aboriginal Population”. Journal of Aboriginal Health, 1(2), 14-23. (2005). Mitchell, T. Report Delivered to Counsel for the Applicants in Ron Plain and Ada Lockridge v Director, Ministry of the Environment et al., Court File No. 528/10 Ontario Superior Court of Justice (Divisional Court). Re: identity, attachment to land, and environmental impact on First Nation communities. (2011).